Do you know your neighbors, or want to get to know them a bit better? Want to contribute to the WVCA but have limited time? The WVCA needs volunteers to help survey the neighborhood as part of our Neighborhood Conservation Plan, and in the future help with disseminating information for important events or meetings. If you have a few hours in the next few weeks (May/June 2017) to walk a block or two of our neighborhood, you can help get the NCP plan underway by inventorying the existing conditions on your surrounding blocks. Through pictures and notes, the NCP plan will catalog areas that the County needs to address in Westover – sidewalk and curb repairs, new lighting, or stop signs or speed bumps at dangerous locations – and you can help us define those areas in need. The areas in yellow have already been surveyed – all other areas need volunteers! I did the stretch of Jefferson Street in the plan; a twenty minute walk with my iPhone camera and a map, and about 30-45 minutes typing up my notes and tagging my photos to the template … and here’s the result. 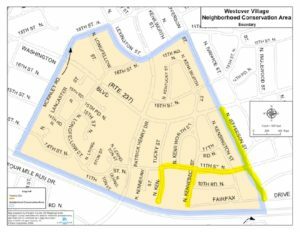 I have a template to share, and can provide you a detailed map to make notes on – please consider helping the NCP Working Group update our Westover Village plan!